I chose this work of Marian Bantjes’ because of how odd and colorful it was, as well as the words on the piece “Lost Child”, since one of my favorite song is titled Lost Boy. In this piece, Bantjes used My Little Pony hair to needle-point the words onto a cross-stitch patch with ready-made alphabet. I am really amazed how she could turn something so ordinary and not relevant into something that has a purpose and meaning. Bantjes introduced contrast, randomness and physicality on such a simple piece and idea: Empathy. My favorite part of this art piece is the randomness of how the hair pieces were placed. This art piece would be way less interesting to look at if the hair pieces just lines behind the stitch patch tidily with coordinated color. Bantjes knows how to keep it interesting by leaving a few pieces of MLP hair on the front of the patch to give it a new dimension and a sense of randomness, a sense of wonder. Which as she mentioned in her TED talk, is a major component that you need when designing something. And that’s what I felt when I was scrolling through her artworks! I looked at it and wondered, stopped scrolling and click in. 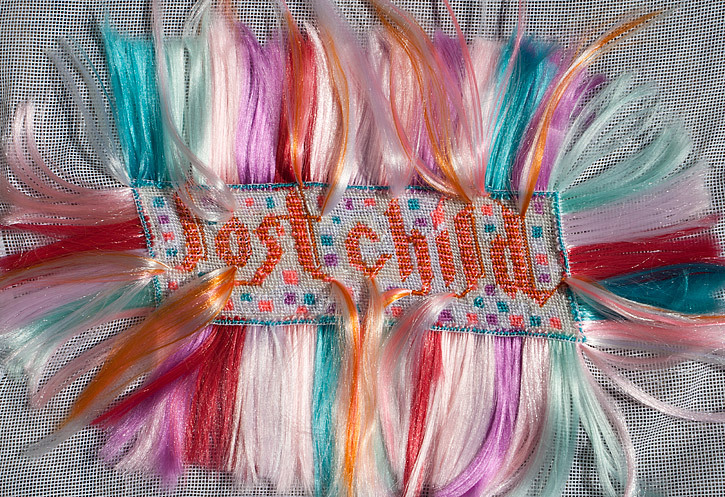 I also like how the words “Lost Child” are all in orange despite all the different colors of hair that’s stitched on this patch, it gives a good contrast with the light blue hair and white background. The lines formed by the hair pieces are all pointed towards the words, which also helps draws the attention to the words. This entry was posted in 336 Blog, Formstorming & Modularity. Bookmark the permalink. This website hosts syllabi, class project descriptions, and a blog for Kristin Carlson Becker’s classes in the Digital Technology & Culture Program at WSU.